The second story-focused DLC pack for Dragon Age: Inquisition has been announced. 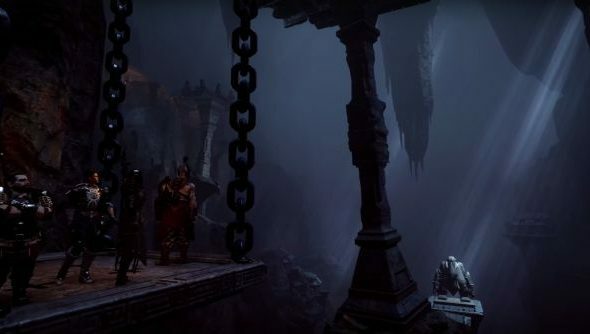 It’s set in the Deep Roads, Thedas’ dungeon realm where the dwarves once lived before being attacked by the darkspawn, Dragon Age’s evil race of corruption and disease that escaped from an alternate dimension. At least, that’s one interpretation of the lore. More importantly, it’s coming out next week on August 11th and this here trailer’s got a big blue mysterious crystal monster. There’s already a lot of mystery surrounding what the Inquisitor will be getting up to down there. Why a sudden adventure into Thedas’ most dangerous region? Who’s that big blue guy? Will there be any more charming poems and broodmothers? A currently 404ing news post on the official site likely holds some answers, but has been devoured by darkspawn. The fiends! This is unlikely to be the final piece of DLC for Inquisition as an epilogue to the main game is currently rumoured and nothing that’s come out so far has acted as more than a sidequest. Whether we’ll see that sooner or, in the style of Mass Effect 2’s Arrival, closer to an inevitable sequel, we do not know. Despite me waking up specially for it, EA’s conference sadly didn’t shed any further light on Bioware’s other major franchise and its upcoming entry Mass Effect: Andromeda. Come on guys, sack off this dungeon stuff and give me spaceguns.